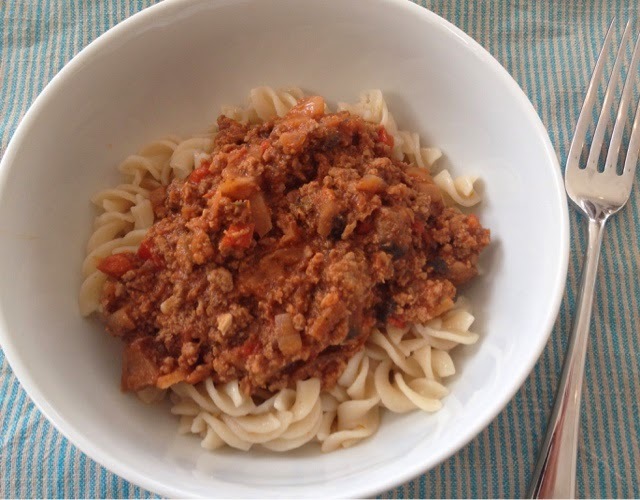 Most people can get together a spaghetti bolognese so the reason for including this recipe is because it includes lots of hidden vegetables that work well with the traditional recipe. I quadruple the ingredients below and make a huge amount in a stock pot and then have 3/4 portions to freeze as well as that night's dinner. I can't always afford or find organic meat but I would always buy organic mince from a supermarket or at least grass fed from a butcher as it is not a stupid price. It's important to get full fat mince - it tastes much better and fat is good for you! I make my own Italian mixed herbs by mixing together equal amounts of dried oregano, thyme, basil, sage and rosemary. I chop the vegetables quite finely because I don't want to draw too much attention to the mushroomsand courgettes with my four year old! I don't grate or blend the vegetables as I still like the interesting texture of the vegetables and the meat but this is an option if you have children (or partners!) who baulk at any noticeable vegetable pieces or require a smooth texture. I cook this with olive oil as I keep everything at a fairly low temperature but if you don't wish to cook with olive oil you could use good quality beef dripping. Ideally the final meat sauce should be left simmering for at least half an hour to develop the taste but if you are in a rush to serve dinner it tastes fine after a ten minutes or so. We don't eat gluten so we use rice or buckwheat pasta but this would obviously work well with any pasta or as a filling for a lasagne. We serve with buttered green beans and or a salad and grated Parmesan. 1 tbsp of tomato purée. - Add the meat, break up with the back of a wooden spoon and cook until meat browned. Stir thoroughly and allow to simmer until it reaches your desired consistency. This will also improve taste. For us and this size portion this will be around half an hour.